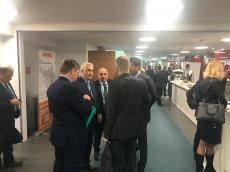 The International Railway Congress 2019, dedicated to the problems of increasing the efficiency of international freight and passenger traffic using digital technologies and transit potential for the existing transport corridors of the Eurasian route, is being held in Vienna, Trend reports referring to CJSC Azerbaijan Railways on March 18. Discussions relating to ways to reduce customs barriers and harmonize legal and technical regulations governing railway transport between Europe and Asia were held within framework of the sessions “One Belt, One Road: Development of International Cooperation”, “How to Attract Investments: Global Transformation of Financing Infrastructure for Transport Projects”, “Digital Railways and Smart Infrastructure: Digitalization, Standardization and Scaling”, “Synergy and Scale Efficiency in development of transport infrastructure ”,“ Erasing boundaries: international cooperation, standardization and scaling ” and “ Mobility and logistics centers of the future”. Minister of Transport of Russia Yevgeniy Dietrich, Chairman of Azerbaijan Railways CJSC Javid Gurbanov, President of Russian Railways Oleg Belozerov, Head of the Polish State Railway Krzysztof Maminskiy, Director General of Austrian Federal Railways Andreas Matte, Head of Railways Of Belarus Vladimir Morozov, Director General of the Swiss Railways Andreas Meyer, Director General of the Slovak Railways Juraj Tkac, as well as heads of the national railway companies of countries of the “broad” and “narrow” gauge, heads of specialized international organizations and the banking sector participate in the congress. The International Railway Congress 2019 is the largest business platform for meeting the leaders of national railway companies. Invited companies contribute to the increase in traffic on the Eurasian route and the sustainable development of the railway corridor between East and West. Based on the best practices of public-private partnerships, the Congress is considering system solutions for modernizing the transport infrastructure, reducing the cost of land transportation, standardizing and intensifying interaction in the 1520mm and 1435mm spaces.